The Yankees will not have back-to-back AL Rookies of the Year. Earlier tonight, MLB and the BBWAA announced Angels slugger-slash-pitcher Shohei Ohtani has been named the 2018 AL Rookie of the Year. Ohtani received 25 of 30 first place votes. 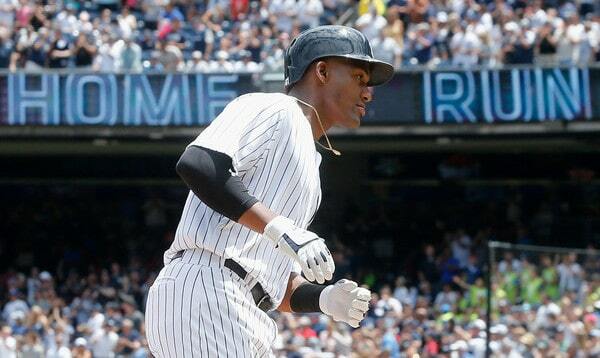 Miguel Andujar came in second and received the other five first place votes. Gleyber Torres finished third. Here are the full voting results. Although Torres was the better all-around player this past season, Andujar was widely regarded as the biggest challenger Ohtani, who was simply incredible. The guy hit .285/.361/.564 (152 wRC+) with 22 homers and threw 51.2 innings with a 3.31 ERA (3.57 FIP) and 29.9% strikeouts. A deserving Rookie of the Year through and through. I would’ve voted for him. Even though Andujar (or Torres) didn’t win, the Yankees did have two of the top three finishers in the Rookie of the Year voting, and that’s pretty darn cool. This is also the third straight year they’ve had a top two finisher in the voting. They’d never done that before. Gary Sanchez was the runner-up in 2016 and Aaron Judge of course won the award unanimously in 2017. The last team with two top three finishers in the Rookie of the Year voting was the Dodgers with Corey Seager and Kenta Maeda in 2016. The last AL team to do it was the 2013 Rays with Wil Myers and Chris Archer. This is the first time since 1949 (Jerry Coleman third), 1950 (Whitey Ford second), and 1951 (Gil McDougald won) that the Yankees had a top three Rookie of the Year finisher in three straight years. Furthermore, the Yankees have now had multiple players receive Rookie of the Year votes in one season for the third time in the last five years. Andujar and Torres did it this year, Judge and Jordan Montgomery did it last year, and Dellin Betances and Masahiro Tanaka did it in 2014. Hopefully Justus Sheffield and someone else (Jonathan Loaisiga? Mike King?) can do it again in 2019. The Yankees do not have any finalists for the other major awards. Some of their guys will get votes, for sure, but they won’t finish in the top three. Managers of the Year will be announced tomorrow with the Cy Youngs and MVPs coming Wednesday and Thursday, respectively.